Welcome to this year's 32nd issue of DistroWatch Weekly! Pardus Linux is one of those lesser-known distributions that many people overlook in favour of the usual big names. But this independently-developed project, generously financed by the Turkish government, is a rather surprising package - a user-friendly operating system with an excellent package management system and a wealth of custom utilities. 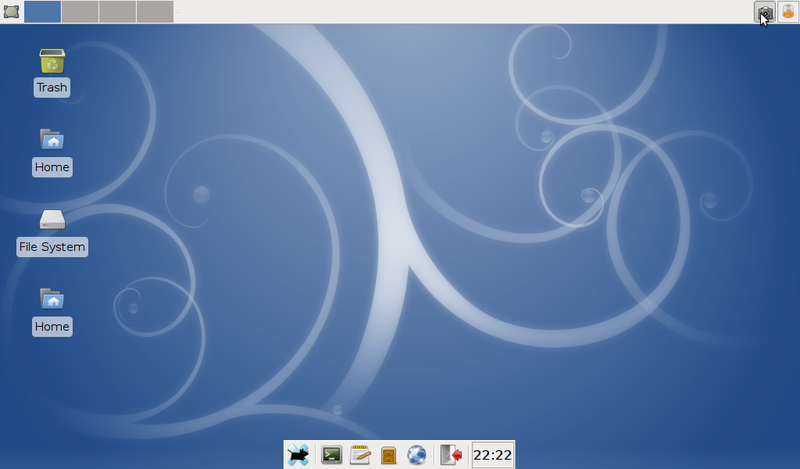 Read our first-look review of the recently released Pardus Linux 2009 to find out more. In the news section, KDE 4.3 makes its first appearance in many popular distributions, Mandriva's "Cooker" continues its rapid march towards the next stable release, Sabayon Linux publishes an update over its next major release, and OpenBSD announces the release date for its upcoming version 4.6. Finally, don't miss the announcement about the new Yellow Dog Linux on a Stick, a 16 GB live USB Flash drive for Sony PLAYSTATION 3. Happy reading! Back on December 1st of last year the DistroWatch Weekly included a report of a detailed case study of Pardus Linux which was published at OSOR.eu. It detailed how Pardus was being used in both the public and private sector in Turkey and how the distribution was saving Turkish taxpayers millions of euros. Pardus Linux is somewhat unusual in that it is a government funded distribution. It was created and is maintained by The National Research Institute of Electronics and Cryptology (UEKAE), an affiliate of the Scientific and Technological Research Council of Turkey. I had read a number of positive reviews and comments about Pardus before that and I decided the next time the distribution had a major release I'd take a look at it. That release, Pardus 2009, came on July 18th and I've been running the distro ever since. Pardus is also different in that it was developed from scratch and it is not derivative of any other Linux distribution (although in its early days it was based on Gentoo Linux). It offers packages for both desktop and server use. It is currently only available for 32-bit x86 compatible systems. Development of a 64-bit version of Pardus is scheduled to begin in September. For this review I am focusing on Pardus on the desktop. Once again I used two systems: my seven month old Sylvania g Netbook Meso (1.6 GHz Intel Atom N270 CPU, 1 GB RAM, 80 GB HDD) and my 6.5 year old Toshiba Satellite 1805-S204 (1 GHz Intel Celeron CPU, 512 MB RAM, 20 GB HDD). Both systems meet minimum requirements for any current Linux distribution and both have hardware which is challenging with some distributions. Pardus is downloadable as a single CD installable ISO image. A live CD edition is not available at this time. There are two ISO editions. The standard edition supports the Turkish and English languages with Turkish as the default. The international edition supports 11 additional languages with English as the default. I downloaded and installed the international edition for this review. Installation on my netbook with an external USB DVD drive was straightforward and really not any different than on any desktop system. For those who cannot boot off an external drive the Pardus Wiki has instructions to install from a USB stick or drive. Installation from an ISO image on a hard drive is also documented in the Pardus forum. Network installations are not presently supported. Pardus uses its own graphical installer called YALI (Yet Another Linux Installer). YALI is probably the simplest hard drive installation program I've tried to date. After a welcome screen it offers the option to verify the installation media which I did for my first install. You can then choose the keyboard layout for your system and your time zone. Next, a user account is set up and the password for the administrator (root) account is set. If you want to use the entire hard drive for Pardus you can let the installer handle partitioning for you automatically. If you choose to manually partition the hard drive(s) this portion of the installation will look very familiar to anyone with any experience installing Linux or using tools like GParted. By default, Pardus uses ext4 for the file system. Other file system choices are ext3, ReiserFS and XFS. Neither LVM nor RAID is supported by YALI. I chose ext4 for my root partitions on both systems but left my existing home partitions (ext3 and XFS respectively) intact. YALI only allows for setting up the / (root), /home, swap, and /mnt/archive partitions. Other commonly used partitions such as /opt, /var, and /usr/local, or custom partitions cannot be created or configured within the installer. The next step is selecting where to install the GRUB bootloader. I chose the default, the master boot record (MBR) of my hard drive. At this point YALI went ahead and installed Pardus to my hard drive. The installer does not include the opportunity to customize the software selection in any way. Every install is essentially the same. Install time on my netbook was about 15 minutes. On my ageing Toshiba, with its incredibly slow internal DVD drive, it was close to two hours. Once Pardus is installed the system is rebooted. The first boot takes a bit longer than I expected but that only was true of that initial boot. Once the KDE 4 desktop is up, an application called Kaptan walks you through the rest of system configuration and customizing the look and feel of your desktop. Kaptan, like YALI, is extremely easy to use. In general, I found the entire installation and configuration process to be user-friendly but also rather inflexible. Of course, an experienced user can do any additional customization once the system is up and running. The only surprise once installation was done was that I found that I had no working network if I didn't go through all the configuration steps using Kaptan. It turns out that YALI had correctly detected and configured both my wired and wireless networking hardware but starts nothing automatically. If you don't want to go through all the wizard-like Kaptan configuration steps, you will need to go into the Network Manager application (not to be confused with NetworkManager, as found in Ubuntu or Fedora) and create a profile for each network interface before they will function. Doing so proved to be simple. In the case of wireless all I had to do was input my ESSID and passphrase and I was up and running. The option for scanning for available wireless networks is also available. X configuration worked perfectly on my netbook and the system did come up with the expected 1024x600 pixel resolution. Things didn't go as smoothly on the Toshiba which has a somewhat quirky Trident CyberBlade graphics chipset. Both during installation and when I booted up to the GUI I was faced with a small display in the middle of my screen surrounded by lots of black space. I've experienced this with other distributions, mainly those based on Slackware Linux. Like many recent distributions, Pardus creates a minimal xorg.conf file. The only way to correct the problem is to create a Monitor section in the xorg.conf file with the proper horizontal and vertical refresh rates. Fortunately, I have a known good xorg.conf file saved for this laptop and once I copied that to the Pardus installation, everything was back to normal at 1024x768 pixels. With the exception of the Trident graphics on the Toshiba, all the hardware in both the laptop and the netbook was correctly detected and configured, including the webcam in my netbook. Pardus is the first distribution I've tried that got my netbook hardware completely right at install time without my having to install a driver or alter a configuration file by hand. Pardus features a KDE 4.2.4 desktop by default. No other desktop environment is installed by default or offered in the base repository. I'm generally not a fan of KDE, largely because it tends to be more resource intensive than other desktops. 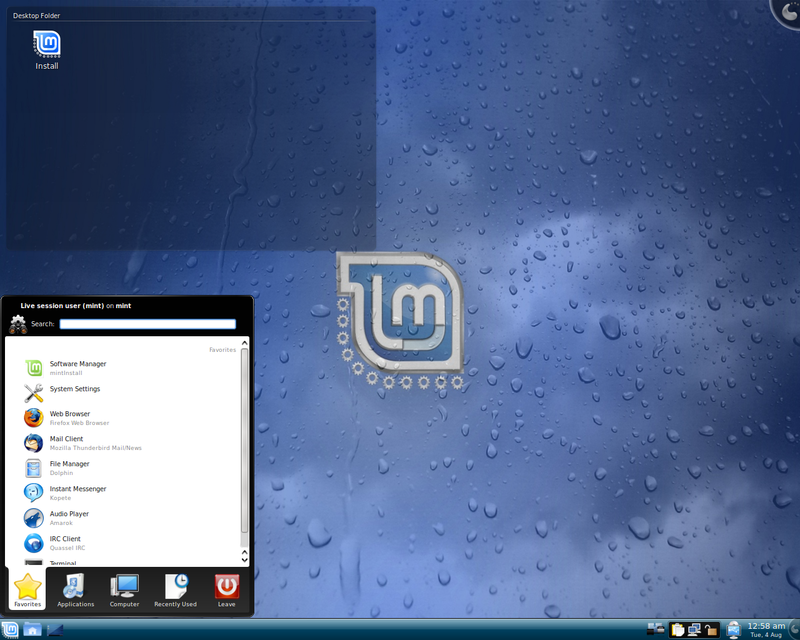 I've been impressed with the look, feel and also the performance of KDE as implemented in Pardus 2009. I've found that my netbook is still quick and responsive. On the old Toshiba, KDE 4 takes a while to start but actually performs better than I expected, with only occasional slight sluggishness. Pardus includes the latest and greatest versions of a wide variety of applications. OpenOffice.org 3.1.0 and GIMP 2.6.6 are installed by default. Those who prefer KOffice will find version 2.0.1 in the repository. Firefox 3.5.1 and Konqueror are the web browsers included, with Arora 0.7.1 and Opera 10.0 beta 2 also available. Plugins for Flash, MPlayer and Java are part of the default installation. A rather wide variety of multimedia applications are also installed or available in the repository. Turkey has no equivalent to the DMCA in the United States so all the multimedia codecs are included as part of the base installation. Everything from MP3s to movie DVDs will play right out of the virtual box. Users in the United States and in other countries with similar laws will need to remove libdvdcss and any offending open source codec packages to bring their systems into legal compliance. Printer, digital camera, and webcam support are all excellent out of the box. I had no problems at all setting up both my Epson and HP printers. A variety of proprietary wireless and video drivers are included in Pardus which will be troublesome to those who want a purely free software environment but will delight those who want their hardware to "just work". Hardware support is undoubtedly aided by the fact that under the hood Pardus 2009 features a very recent 2.6.30.1 kernel. An updated 2.6.30.4 kernel is now also available and can be easily installed with the PiSi package manager, either the graphical or command line editions. I have found a few minor bugs. On two occasions I clicked on the battery monitor applet and the window opened as expected. When I tried to adjust settings, the applet crashed and took the window manager with it, effectively restarting my session. This problem is intermittent and I have no idea if it is unique to Pardus or a general issue with KDE 4.2.4. I have also had OpenOffice.org Writer lock up on me once. Another issue -- not a bug per se, but rather an annoyance -- is the way the Pardus Network Manager works. If I start working on my wired connection at home and then unplug the Ethernet cable and pick up the netbook or laptop to work somewhere else, I expect wireless networking to come up automatically. Both NetworkManager and wicd support this functionality. The Pardus Network Manager does not. In addition, sometimes the graphical network manager won't allow me to change network interface at all. I have to do it old school from the command line or else restart the system. In fairness, I should point out that wicd is available in the "contrib" repository so it shouldn't be difficult to replace Network Manager with what I consider a more capable alternative at this point. One problem common to all the recent releases of major distributions is a regression in the Intel video drivers that seriously impacts the Intel Express Graphics 945GM chipset in my Sylvania netbook. The Intel video driver included with Pardus is version 2.7.99.902, pre-release code for the latest 2.8.0 driver. This driver resolves some but not all of the issues I've experienced. UXA and DRI2 are now enabled by default and EXA and DRI support has been eliminated. Unlike the Fedora, Mandriva, and Ubuntu releases in recent months, this driver is not unstable on my system with UXA enabled. I have experienced no X crashes at all. Video performance is also much improved. I do still see some weird video artefacts with 3D effects enabled in KDE, mainly vertical lines across new windows for the first second or so they are open or on pop-up menus, similar to what I described in my review of Mandriva 2009.1. I have no such problems, indeed no problems at all, with 2D graphics. Thanks to the performance improvements and a now stable driver, I no longer consider the Intel video regression to be a serious or show-stopping bug in Pardus 2009. It's down to the level of an annoyance I'd like to see fixed. In point of fact I've found no serious or show-stopping bugs in Pardus at all. No distribution is perfect and all have some issues. In general, I found the Pardus implementation of KDE 4 to be the nicest I've tried to date and I have generally been very impressed by what the distribution offers. 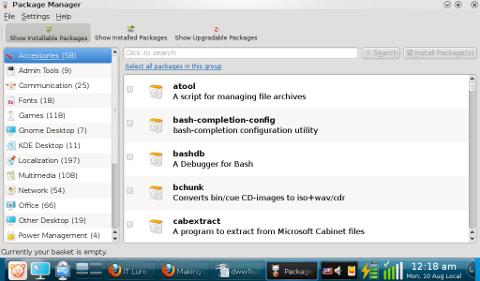 Pardus uses its own unique package manager called PiSi which, in turn, uses packages in a unique format. PiSi includes both a graphical and a command-line interface. I found the graphical version easy to use but a little slow when searching the package database. One nice feature found in most user-friendly Linux distributions nowadays is some sort of notification icon on the panel when new package upgrades are available. Pardus has no such feature. You have to go into PiSi and click on "Show Upgradable Packages" to see if anything new is available. The command line edition of PiSi offers a lot of additional functionality not available in the GUI edition. One particularly interesting feature is the "emerge" option. Similar to the emerge command in Gentoo Linux, this option allows the installation of source packages into Pardus. A detailed guide to PiSi CLI usage is available in the Pardus Wiki. While the selection of packages in the base Pardus repository is somewhat limited, there is an official "contrib" repository and several small unofficial repositories that offer additional packages for Pardus. Those who aren't fans of KDE 4 will be pleased to know that the "contrib" repositories include both GNOME 2.24 and Xfce 4.6.1 desktops, as well as many packages from the Xfce Goodies project and a fairly nice variety of additional applications. I installed Xfce, my preferred desktop environment, and found it to be a flawless implementation. Information on adding the additional repositories can be found in the Pardus forum. Even with the additional repositories, the selection of packages for Pardus is not nearly up to the level of distributions like Mandriva, Ubuntu, or openSUSE. The selection does stack up very well compared to other second-tier distributions and does provide a decent variety of software choices. For those interested in compiling from source or building packages for Pardus, you will first need to install build essentials, similar to what Debian requires. Excellent documentation on building PiSi packages and contributing them is available in the Wiki. Approximately 50 package upgrades have been available to me since I installed Pardus, including an upgraded 2.6.30.4 kernel and the related headers, sources, and modules. I am normally distrustful of automated kernel installations but I decided to test this on Pardus using the graphical edition of PiSi. The process went absolutely smoothly and, on the next boot, an additional GRUB menu entry with the new kernel was available. PiSi correctly installed the new kernel side by side with the old one. In general, I have had no problems whatsoever with the package upgrade process using PiSi either at the command line or in the GUI. My only concern at this point is the speed with which the Pardus developers are able to get some security patches to the user community. While the steady stream of package upgrades indicates that the issue is taken seriously, there still is no package for Firefox 3.5.2, a security patch which closes known vulnerabilities, including two Mozilla classifies as "critical". I asked about this on the Pardus forum and was informed that building and testing the package may take a few more days. I have checked the Pardus test repository and so far there is no package. The only option for the security conscious is to get the update from upstream which effectively, at least temporarily, defeats the package management process. All the other distributions I currently have installed on my systems -- Ubuntu, VectorLinux, Slackware Linux, Red Hat Enterprise Linux and Scientific Linux -- have been able to release updated Firefox packages within 24 - 48 hours of a Mozilla release. As I mentioned at the outset, the international edition of Pardus supports something like 13 languages. The Pardus definition of support is a little different that some other distributions. These are the languages you can select in the YALI installer and these are also the languages that the Pardus-specific applications and tools like PiSi, Network Manager, the System Settings tools and Kaptan are translated into. As it turns out, other languages do work very well indeed. 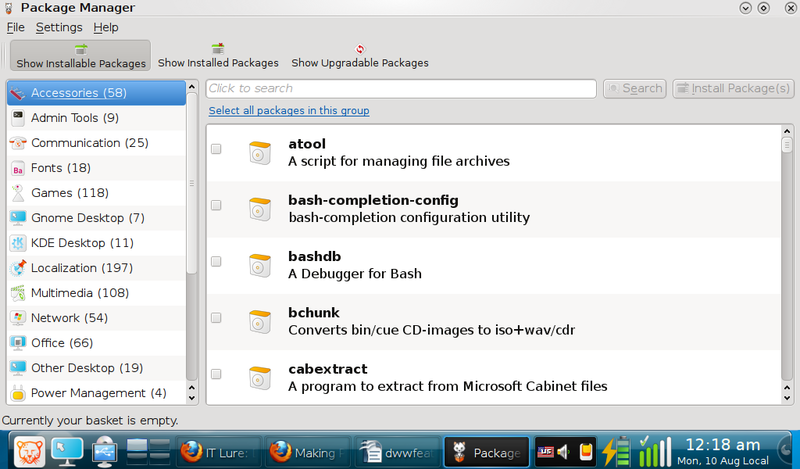 The set of KDE i10n packages, KOffice i18n packages and glibc locales included in the Pardus repository are complete. I had no problem setting up a very functional Hebrew desktop using Pardus. What I did find missing are Aspell dictionaries and some language packs for "unsupported" languages but those are generally not difficult to install from upstream sources. Pardus by default uses KDM as its display manager. Unfortunately, KDM does not support selecting an alternative language when logging into the system. However, GDM is available in the "contrib" repository and changing the default display manager from KDM to GDM is well documented. In addition, Pardus graphical system configuration tools include the ability to change the user default language and locale from within the GUI. Panel applets in both KDE and Xfce to change the keyboard layout on the fly also work perfectly well. In general, internationalization and localization in Pardus is well thought-out and should work well regardless of your choice of language. Users of "unsupported" languages will, at worst, have to get language packs, some dictionaries, specialized applications, and perhaps specialized fonts from upstream. While official support of additional languages would certainly be a plus and language support is nowhere near as complete as what is offered by the major distributions, in general, adding language support should be painless for a moderately experienced Linux user. While I had heard and read good things about Pardus for a few years now, I had never tried the distro until the 2009 release. I haven't been this enthusiastic about a new distro I've tried in quite some time. I didn't find any serious bugs which prevented me from working or which really got in my way at all. The implementation of KDE 4 is probably the best I've seen and represents the first time I've truly been comfortable working with the latest incarnation of KDE as my desktop environment. 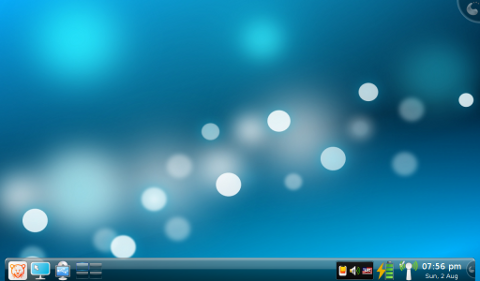 The implementation of Xfce is also first rate. Pardus also offers an excellent variety of unique graphical system administration tools that are intuitive and work as expected. Anything available in the GUI also has a command-line equivalent. In the case of PiSi, the Pardus package manager, the CLI edition also offers additional functionality. Pardus is generally very user-friendly. There are a few convenience features found in the major distributions, such as automated upgrade notification and automatic network interface switching, that are still lacking in Pardus. These aren't bugs but rather are missing niceties that I've gotten used to in other distros. The Pardus developers do encourage filing wish list items in their bug-tracking system and I may just have to add a few. Internationalization and localization is well done and is nearly, but not quite, complete for "unsupported" languages. It is very complete and functions flawlessly for officially supported languages. I found the forum, Wiki, and in general the English-language documentation for Pardus to be excellent. When I did post in the forum, I received a quick, friendly, and helpful response. That's all anyone can ask of the community behind any distribution. Pardus has a lot to recommend it and definitely rates a try for anyone who wants an excellent KDE 4 implementation. Pardus isn't perfect, but its flaws and shortcomings are relatively minor compared to many if not most other distributions I've tried, including recent releases of some of the big names in Linux. It's easy enough to install and use that I would certainly consider it a good candidate distribution for a new Linux user, yet it doesn't lack the features and, apart from the YALI installer, the flexibility an experienced user will desire. I am definitely impressed with Pardus 2009. The biggest event of the week was, of course, the release of KDE 4.3, a long-awaited major new version of the popular desktop suite. openSUSE was one of the first distributions to provide KDE 4.3 - both via its web-based install system and as unofficial live media: "Get the latest KDE hot off the presses! The KDE project announced the stable KDE 4.3 release this week, and openSUSE users can get the goods right away. The KDE 4.3 release is available via One-Click Install for openSUSE Factory, 11.1, 11.0, and 10.3. Stephan Binner has provided a KDE 4.3 live CD using the openSUSE Build Service and KIWI. The live CD is a pure KDE showcase based on current openSUSE 11.1 packages. Note that the live CD and packages are not an official openSUSE release and have not been as fully tested as final openSUSE releases. The latest KDE includes a number of new features, application updates, performance and usability improvements, and much more. See the KDE 4.3.0 release announcement for a list of improvements and updates." Most other distributions, including Arch Linux, Fedora, Mandriva Linux and Kubuntu (but not Slackware Linux), were quick to update the KDE packages in their development repositories to the latest stable release, while Debian GNU/Linux has released an unofficial KDE 4.3 live CD for the i386 architecture. The developers of Mandriva Linux have been hard at work preparing "Cooker", the distribution's development branch, for release as version 2010 in early November 2009. But what exactly has been getting the most attention, besides the above-mentioned KDE 3.5 update? Frederik Himpe has been publishing regular summaries of the latest Cooker updates: "Pam was updated to stable release 1.1.0 and Hal version 0.5.1 is now in Cooker; GNOME 2.27.5 is now available, Totem's YouTube plug-in is working again; Python 3 is now available but for compatibility reasons, Python 2.6 will remain the default Python; F-Spot has been updated to version 0.6.0, one of the nice things is a folder bar which you can use to organize folders to your liking; VirtualBox 3.0.4 entered Cooker; Emacs 23.1 includes many major improvements - UTF-8 support, font anti-aliasing, running text terminals and X displays in one Emacs session, Ruby support and more; urpmi and it's back-end perl-URPM have seen many improvements which should help resolving complex dependencies...."
Fixstars, the company that develops the Yellow Dog Linux (YDL) distribution for PowerPC processors, has announced the availability of a bootable Linux USB drive for SONY PLAYSTATION 3: "Fixstars today announced the availability of 'YDL on a Stick', a USB flash drive containing a bootable edition of Yellow Dog Linux 6.2 for the Sony PS3. With 'YDL on a Stick' installation has never been easier -- simply plug-in the USB stick, install the bootloader, boot into YDL -- and you're running Linux on your PS3. 'YDL on a Stick' comes with a customized edition of YDL 6.2 on a 16 GB OCZ Diesel flash drive. It offers the full functionality of the 6.2 release, including: an updated Linux kernel 2.6.29 for 64-bit systems, OpenOffice.org 3.0, Firefox 3.0.6, IBM Cell SDK v3.1.0.1, Xfce 4 - a fast and lightweight desktop environment." YDL on a Stick for Sony PLAYSTATION 3 is available from the company's online store for US$59.95. Kelly Schwartz (aka "wolfden") has published an update on the release of Sabayon Linux 5.0, a major new version of the increasingly popular Gentoo-based desktop distribution: "As our roadmap shows, the Sabayon Linux 5 release date is coming fast. Unfortunately we are looking at a late August or first part of September for a final release, but we hope to have our first beta disk for the testing team shortly. Remember, you will be able to roll your 4.1 or 4.2 to 5.0 by hopping to branch 5. Joost has been busy with getting branch 5 ready and Fabio has been busy hammering it into shape. Our testers have been busy testing branch 5 and reporting bugs, they are doing a great job. Ian has been working out the artwork for Sabayon Linux 5. I haven't even seen it myself yet, but I am sure it will be fantastic. Fabio has also implemented i18n support on installer, as well as encryption." It looks like the Sabayon development team is working hard to bring us the latest and greatest the Linux world has to offer. FreeBSDNews reports that BSD Magazine, the only English-language print magazine devoted to the BSD operating system, is giving away a free CD containing BSD Magazine and Linux+ archives to all new subscribers: "As most of you will know by now, the BSD Magazine will continue to stay. For a few weeks its future existence was in doubt, but with a number of last-minute subscriptions and magazine sales, the publisher has decided to give the magazine another chance. Chief editor of the magazine, Karolina, contacted me to let you all know about a special subscription offer that's on: take out a one-year or two-year subscription of the BSD magazine, choose issue 3/2009 as your starting issue, and you will receive a free CD with the BSD Magazine and Linux+ magazine archives! Also, the magazine will contain 90 pages going forward instead of 60." If you'd like to take advantage of this offer, you need to subscribe before 20 August! Finally, here is something that could be of interest to some distribution developers. Open Invention Network (OIN) is an intellectual property company that was formed in order to protect Linux from patent issues: "Open source software development has been one of the greatest sources of innovation. It has reduced costs, improved functionality and spurred new industries. In particular, the Linux community has been able to make tremendous strides in improving the customer experience because developers can take what has been written and build on it -- without having to develop the same base of software code building-blocks from scratch." According to OIN's Frank Casey, the company was formed by IBM, Red Hat, Novell, Sony, NEC, and Philips in an attempt to protect the Linux community from patent issues that might dampen its growth and development. They have been trying to spread the word to as many Linux distributions as they can in an effort to get them to join OIN. For more information please visit OpenInventionNetwork.com. Clement Lefebvre has announced the release of the "KDE" edition of Linux Mint 7: "The team is proud to announce the release of Linux Mint 7 'KDE'. 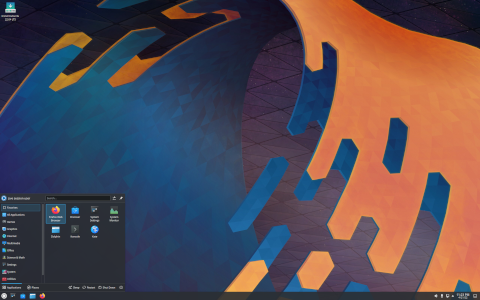 Based on Kubuntu 9.04, Linux 2.6.28, KDE 4.2.4 and X.Org 7.4, Linux Mint 7 'KDE' community edition features a lot of improvements and the latest software from the open source world." Highlights: "KDE 4.2.4 and Amarok 2.1 - the latest and shiniest KDE desktop and applications; mintInstall improvements - featured applications, pre-filled information, seamless screenshot downloads, improved GUI layout; mintUpdate improvements - changelogs, package sizes, usability; mintUpload improvements - ads-free, GUI improvements, graphical service manager, SCP/SFTP support; mintWelcome; command-line goodies - APT version, RTFM...." See the release announcement and release notes for further information. Silvan Calarco has announced the release of openmamba GNU/Linux 1.1, a maintenance update of the general-purpose distribution offering out-of-the-box support for popular graphics drivers and media codecs, among other features: "The new 1.1 release of openmamba GNU/Linux is available for download. It is a maintenance release with support for recent hardware platforms and fixes to improve system usability and stability. This release includes: all software updates made available after openmamba 1.0 release; 2.6.28.10 kernel with wireless and audio drivers backport with support for the most recent devices; wicd network manager for easier access to wireless networks; X.Org Server 1.4 with updated video drivers...." Read the rest of the release announcement for further details. Slax 6.1.2, a small Slackware-based live CD featuring the KDE desktop 3.5, has been released. What's new? "Upgraded Slax kernel to 2.6.27.27, which contains many bugfixes; added xz package (LZMA compressor and decompressor); added support for TXZ Slackware packages; upgraded Midnight Commander to understand TXZ packages; fixed incorrect reporting of module file path in Slax Module Manager (if size of module was smaller than 1 MB, it didn't show module file at all); fixed incorrect slaxsave.dat (the 1 GB one); added 2 GB slaxsave.dat file to the ZIP archive; added Firefox 3.5.1, as a separated module 007-firefox.lzm, this version integrates itself into KDE; added Slax drive support." Read the rest of the changelog for a complete list of changes. Estrella Roja 2.5, a Debian-based distribution and live CD made in Argentina, has been released. This version is still based on the stable Debian GNU/Linux 5.0, but includes some stability improvements and a number of backported application updates, such as Pidgin 2.5.8 (with many plugins), Firefox 3.5.1 and Nmap 5.00. Some packages were replaced by their functional, but lighter equivalents, e.g. Network Manager has been replaced by wicd. Also includes some bug fixes to udev, new scripts, Truecrypt 6.2a and the Firestarter firewall. The KDE 3.5 theme has also been updated to a more modern variant, while new links to the distribution's web site have been added. Please read the brief release announcement (in Spanish) for further information. Rubén Rodríguez Pérez has announced the release of Trisquel GNU/Linux 2.2, a 100% libre, Ubuntu-based distribution for home, office and school deployments: "Trisquel GNU/Linux 2.2 'Robur' is ready for download. This is the third and last maintenance update for the 2.x LTS branch, which will be supported until 2013. The six ISO images released today - 32-bit and 64-bit for all three editions - include more than 200 package updates, a new and cleaner GTK+ theme, and four new pre-installed languages - the list now includes English, Basque, Catalan, Chinese (simplified), French, Galician, Hindi, Portuguese and Spanish. This language selection matches the one in Trisquel 3.0, which is almost ready for release." See the full release announcement for additional information. Dieter Plaetinck has announced the release of a new set of installation CD images for Arch Linux, version 2009.08: "These images are built from a current snapshot of core, which includes Linux kernel 2.6.30.4, udev 141 and Pacman 3.3.0. Changes compared to 2009.02: more up-to-date software; usage of new AIF installer, which brings better disk editor with support for dm_crypt and LVM setups, support for automated installations using configuration files, a framework to build your own installation procedures, better date/time setting with NTP support, re-factored GRUB installation routines and usability improvements; Aufs instead of Unionfs; enhanced boot device detection on image start; bug fixes (XFS freeze, mirror setting, clock corrections, network settings)." See the release announcement and release notes for more details. The OpenBSD project has published a feature list for the upcoming release of version 4.6, scheduled for 1 October 2009. As usual, a long list of improvements, new driver additions and other features can be found on the OpenBSD 4.6 Release page. The new product is now available for pre-order from the project's online store (C$50 + shipping and handling). A change regarding the version number of ATI proprietary driver (ati-driver in the package list) was implemented last week. Based on the feedback by Matthew Tippett, AMD's Linux Core Engineering Manager, we have now changed the version number of the latest ATI Catalyst driver from 9.7 to 8.632. The main reason is that the number 8.632 refers strictly to the ATI driver only, while the number 9.7 is more like a suite containing other drivers and applications. To find out which driver version is included in each Catalyst release (since the file available for download contains only the Catalyst version, i.e. 9.7 in this case), it is necessary to check out the release notes (the latest ones are available here). PLoP Linux. PLoP Linux is a small distribution that can boot from CD, DVD, USB flash drive (UFD), USB hard disk or from network with PXE. It is designed to rescue data from a damaged system, backup and restore operating systems, automate tasks and more. Super OS. Super OS (formerly: Super Ubuntu) is a modified version of Ubuntu with the goal of making it more usable while trying to remain compatible with Ubuntu. Features compared to Ubuntu include better multimedia support, improved Internet experience (aMSN, Opera, Flash, Moonlight and Google Gears), App Runner, and other software, such as Java, Ubuntu Tweak, live USB creator and KDE/Qt libraries. Grusha Linux. Grusha Linux is an Ubuntu-based distribution designed for Ukrainian and Russian speaking users. PTS Desktop Live. PTS Desktop Live is an Ubuntu-based Linux distribution designed to provide a free software platform for carrying out system tests and hardware benchmarks in an automated, reproducible, and effective manner. PTS Desktop Live is designed around the Phoronix Test Suite with the operating system itself consisting of a stripped-down Linux environment, then built upon that is the Phoronix Test Suite with its test profiles and suites. Scentlinux. 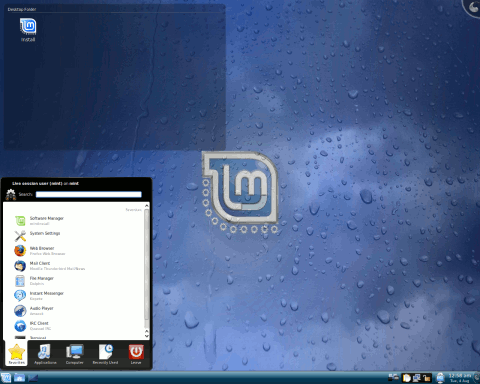 Scentlinux is a multimedia-oriented distribution based on paldo GNU/Linux, with Xfce as the default desktop. Zencafe GNU/Linux. 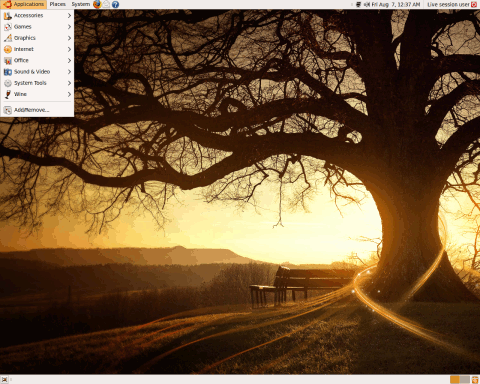 Zencafe GNU/Linux is a Zenwalk-based distribution designed specifically for use in Internet Cafés. It included auto-recovery features and Internet Café management software. And this concludes the latest issue of DistroWatch Weekly. The next instalment will be published on Monday, 17 August 2009.